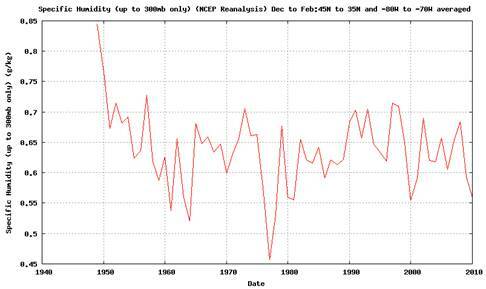 Increasing atmospheric CO2 does not by itself result in significant warming. 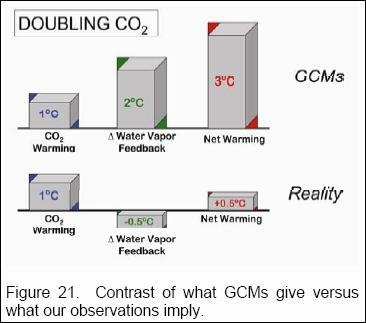 The climate models assume a significant positive feedback of increased water vapor in order to amplify the CO2 effect and achieve the future warming reported by the IPCC. According to the models, as the Earth warms more water evaporates from the ocean, and the amount of water vapor in the atmosphere increases. Since water vapor is the main greenhouse gas, this leads to a further increase in the atmospheric temperature. The models assume that changes in temperature and water vapor will result in a constant relative humidity (i.e. as temperatures increase, the specific humidity increases, keeping the relative humidity constant. This is one of the most controversial aspects of the models. Studies have contradictory findings regarding this. Models that include water vapor feedback with constant relative humidity predict the Earth's surface will warm more than twice as much over the next 100 years as models that contain no water vapor feedback. The water vapor feedback issue is a crucial one since without the feedback, not only are the models wrong, there can be no significant warming. Roger Pielke provides a brief summary of the issue [http://climatesci.org/2007/12/18/climate-metric-reality-check-3-evidence-for-a-lack-of-water-vapor-feedback-on-the-regional-scale/] as well as a link to a research paper that states: “atmospheric temperature and water vapor trends do not follow the conjecture of constant relative humidity”. 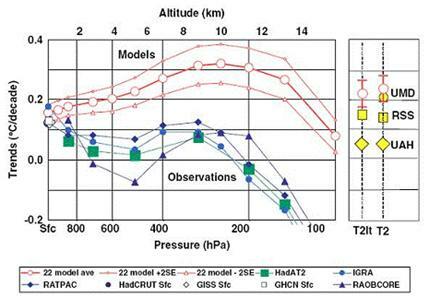 The IPCC 2007 Report Chapter 9 – Understanding and Attributing Climate Change [http://ipcc-wg1.ucar.edu/wg1/Report/AR4WG1_Print_Ch09.pdf] provides a climate model based simulation of the expected CO2 “spatial signature” of all forcings including anthropogenic CO2 (left-hand figure below shows degrees change per decade). 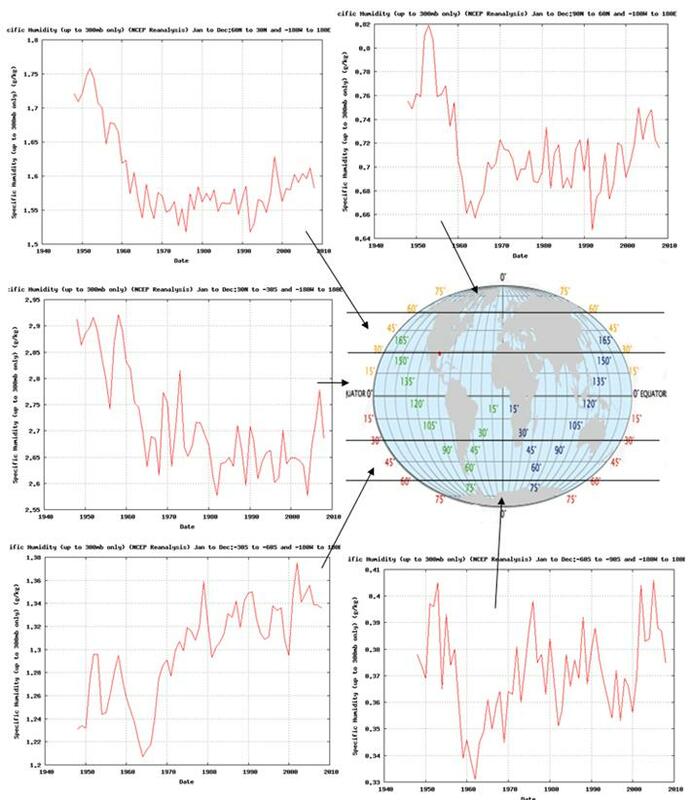 However, a study of actual data from radiosonde data shows a non-CO2 based signature [http://www.climatescience.gov/Library/sap/sap1-1/finalreport/sap1-1-final-chap5.pdf]. The models predict a large tropical increase in temperature in the 300 mb range, due to increased water vapor in the troposphere. This can be seen in both the figure above and below left. 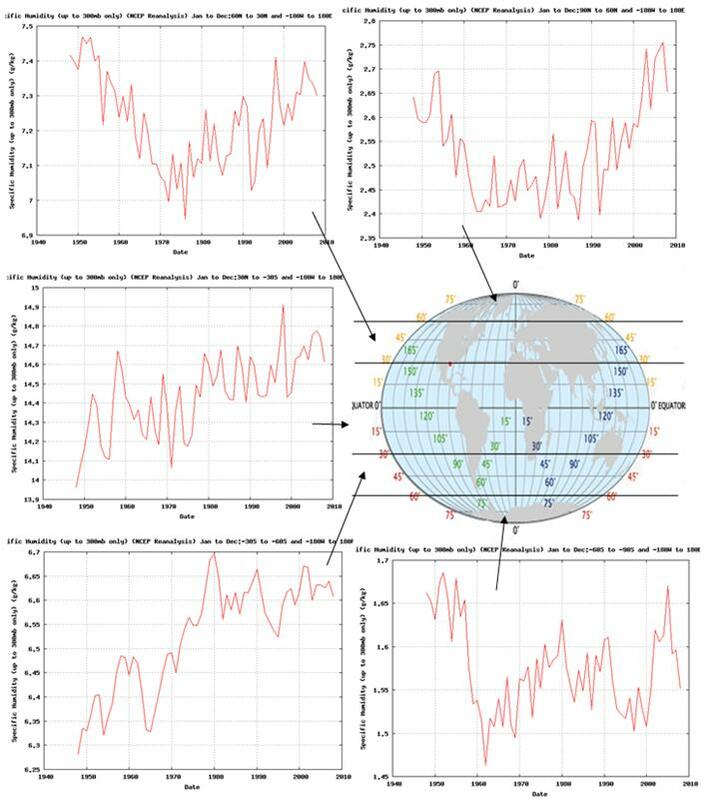 A 2008 study of the satellite-era temperature data (Christy & Douglass: “Limits on CO2 Climate Forcing from Recent Temperature Data of Earth” [http://arxiv.org/ftp/arxiv/papers/0809/0809.0581.pdf]). “The recent atmospheric global temperature anomalies of the Earth have been shown to consist of independent effects in different latitude bands. 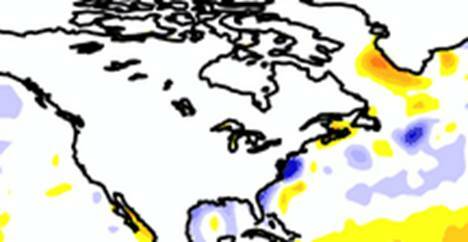 The tropical latitude band variations are strongly correlated with ENSO effects. …The effects in the northern extratropics are not consistent with CO2 forcing alone … These conclusions are contrary to the IPCC  statement: “[M]ost of the observed increase in global average temperatures since the mid-20th century is very likely due to the observed increase in anthropogenic greenhouse gas concentrations.”” They found that the underlying trend that may be due to CO2 was 0.07 degrees per decade. The following figure is from the same study. 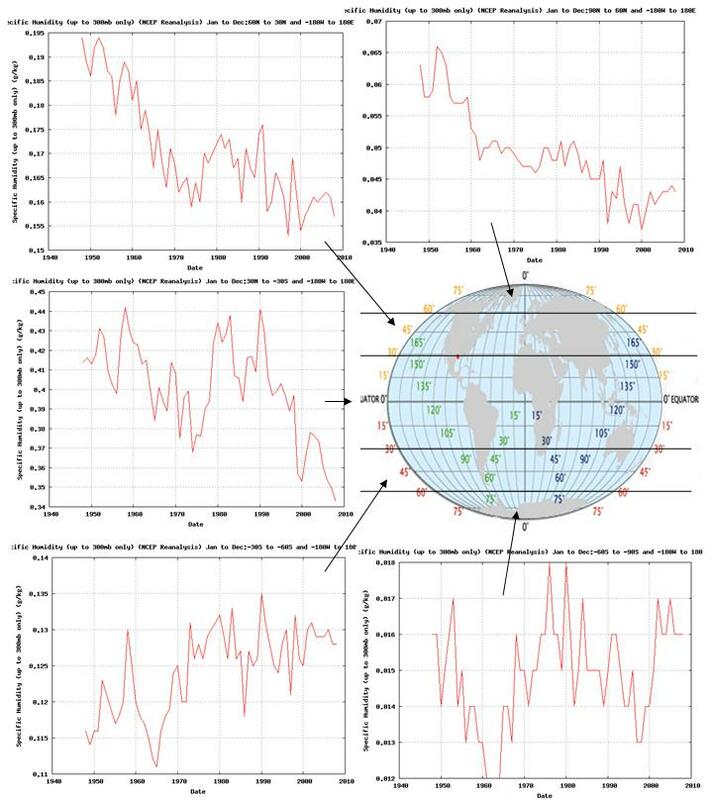 The NOAA Earth System Research Laboratory [http://www.cdc.noaa.gov/cgi-bin/data/timeseries/timeseries1.pl] provides plots of trends of various data items from the NCEP / NCAR reanalysis database. The following figures show the specific humidity at 300, 600 and 1000 mb (1000 mb is near the earth’s surface, refer to the figure above to see that the approximate altitudes that 600 and 300 mb correspond to are roughly 15,000 and 30,000 feet). 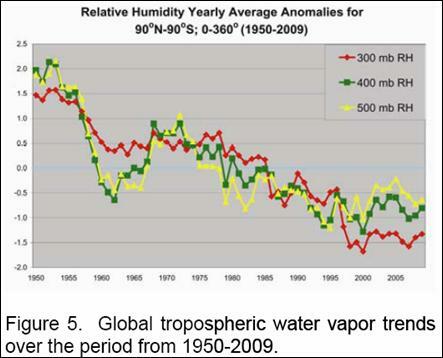 The following figures show the specific humidity trends from 1948 to 2008 for the 300 mb (left), 600 mb (center) and 1000 mb (right) for the entire Earth. The general trend is decreasing specific humidity at 300 mb and increasing specific humidity near the Earth’s surface (1000 mb). The following figures show similar data by latitude bands of the Earth. The specific humidity at 300 mb (the altitude which should be showing the most warming according to the CO2 theory) has been decreasing for most of the world. 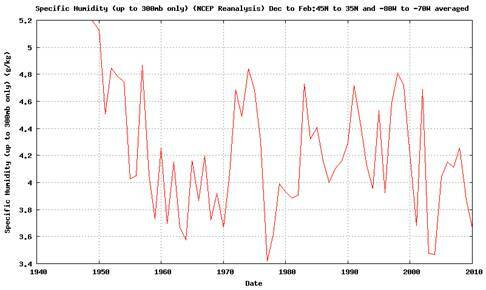 In the southern hemisphere it has not been decreasing, but also has not increased since the 1970s. 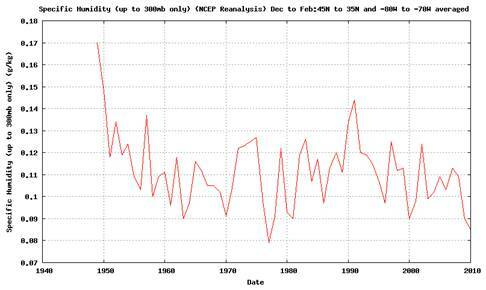 The specific humidity at 600 mb was been decreasing for most of the world until the 1960s, then shows an increasing trend. 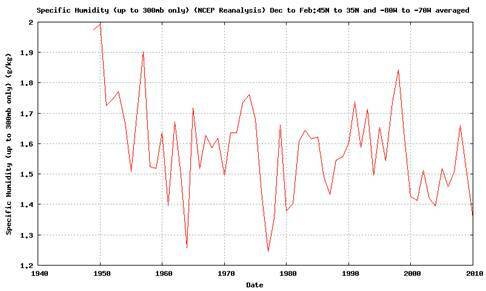 The specific humidity at 1000 mb (near the Earth’s surface) was been decreasing for the northern hemisphere, then shows an increasing trend starting around 1970. For the southern hemisphere there has been no trend since 1970. The specific humidity has been increasing over the last few decades near the Earth’s surface (as shown by the 1000 mb data), while it has been decreasing in the upper troposphere (as shown by the 300mb data). The increase in specific humidity at the Earth’s surface (1000 mb) is related to surface temperatures. For all except the far southern hemisphere bands, the effect of the 1997/98 El Nino can be seen in the specific humidity graphs. The decreasing specific humidity in the upper troposphere (300 mb) indicates that the warming at the Earth’s surface does not match the CO2 based warming theory. This is especially so in the northern hemisphere, which has experienced most of the warming in recent decades. 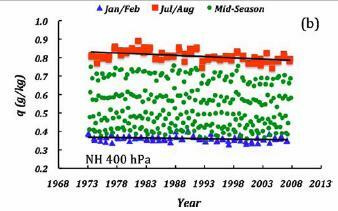 The above paper also shows the geographic distribution of specific humidity trend at 400 hPa from 1973 – 2006. 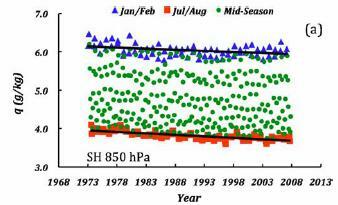 The following figures show the average annual sea surface temperature (SST) anomalies for 1973-2007 for the two regions with strongest trends in specific humidity in the figure above. The area with strongest negative trend is shown in the red line below (5N-5Sx160-180E) and the area with the strongest positive trend is shown in the blue line (0-10Nx80-100W). There has been no net warming in the area with positive specific humidity trend, while there has been slight warming in the area with the negative specific humidity trend. A 2010 study reported in ScienceNews “Crop Irrigation Could be Cooling Midwest” [http://www.sciencenews.org/view/generic/id/55527/title/Crop_irrigation_could_be__cooling_Midwest] states: “While average global temperatures rose about 0.74 degrees Celsius during the past century, the U.S. Midwest has experienced a noticeable slump in summer temperatures in recent decades … the recent cool temperatures seem to be part of a steady long-term decline in summertime highs in Chicago” … “Changnon suggested that fewer hot days and more precipitation are linked, because humid air warms more slowly than dry air does. One likely source of the extra moisture is the region’s agriculture. Plants pump vast amounts of water from surface soil into the atmosphere as they grow, and thirsty row crops such as corn and soybeans are much more prevalent in the region these days”. The following figures show the specific humidity (i.e. 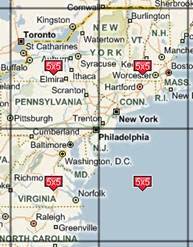 the amount of water) in the atmosphere from the NOAA ESRL Physical Sciences Division [http://www.esrl.noaa.gov/psd/cgi-bin/data/timeseries/timeseries1.pl] for the area of 35-45N x 70-80W (area indicated in the map). The plots are shown for the December – February time period for 4 atmospheric heights: 300mb, 400mb, 600mb, and 1000mb. It is clear from the above figures that winter moisture content in the atmosphere has not increased during the global warming era in the US eastern seaboard area. The following figure shows the 700mb specific humidity for Dec – Feb for the expanded area of 25-50N x 60-80W, encompassing more ocean area for the formation of storms. 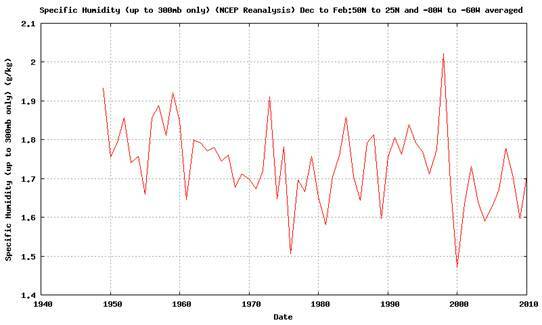 No increase in moisture content (except in the 1998 El Nino year) and a definite declining trend over the last 60 years during the global warming era – the opposite of what Al Gore claims.